Satala is drought prone village nestled among the mountains located in dist. Auranagabad, Maharashtra. Safe and potable drinking water is a dire need of the village. Satala is nestled by the range of hills and due to the hilly area it has hard rock and there is no permanent source of ground water , hence the agriculture is rainfed and dependant on the vagaries of monsoon which is erratic and scanty. This results in low productivity of foodgrains and other crops. The main occupation of the village community is agriculture which is insufficient to support the livelihoods; therefore the people have to migrate in nearby towns and sugar factories in search of labour work. The total no. of house hold is 160 , out of which 110 households belongs to the Vanjara (nomadic tribes ) and 45 households to the scheduled caste and 5 households are OBC category. Due to the hard rock aquifer in the underground there is no scope of striking water to the bore wells. Therefore there is no single bore well / hand pump in the village. The village faces acute drinking water problem, therefore the Govt.had implemented the regional drinking water scheme involving a cluster of eight villages in 1983-84. The drinking water was lifted from a well which was located below the percolation tank and the same was transported about 9 km. covering eight villages. But due to the insufficient water in the well, for all eight villages (7500 population ) this scheme runs only 7-8 months and rest of the month it is non-functional. Now since last 10 years the situation has become worse due to the insufficient rains as well the electric shortage and load shedding of electric supply. After the completion of the scheme in the initial first 2-3 years the water supply was received by this village except in summer. But since last 10 years, as the location of the village is at the tale of the distribution system, did not receive the water supply. Therefore, the main pipeline to this village is totally damaged and having no use. At present the village community does not have any permanent source of drinking water. The women and children especially the school girls have to travel 2-3 kms every day to fetch the water from the private wells. Since last 10 years in the summer, all these wells run dry and the drinking water is supplied by the tankers continuously specially in the months from March to June/July. 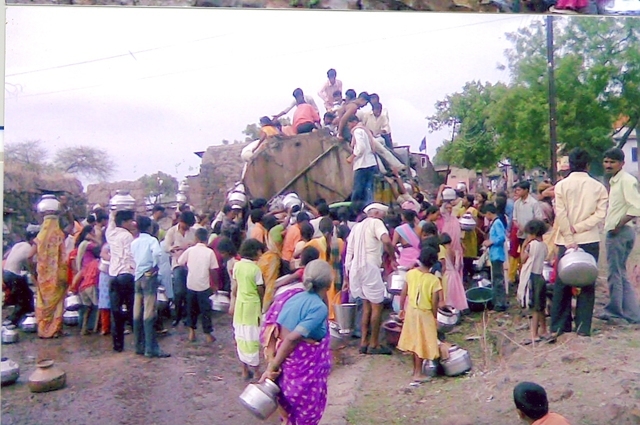 Sometimes the tanker water is not safe for drinking purpose as it is filled from the storage tanks without any treatment, causing to water-borne diseases and affecting the heatlh of the villagers and specially children. - Excavation and construction of new well. - Laying of underground raising main pipeline of 2500 meters in length. - Laying down underground distribution system pipeline of 900 meters in length with air valves, non return valves etc. - Repairs of existing water storage tanks of 40,000 liters capacity. The villagers have planned to implement a separate drinking water scheme for their village without relying on Govt. It is envisaged to excavate and construct a new well in the water submergence area of the percolation tank and lift the water by installation of the electric pump on the well. The water would be transported through underground raising main pipeline of 2500 meters in length. The water would be stored in the existing water storage tank which has a capacity of 35,000 liters. The water would be distributed through new distribution system pipeline of 900 meters in length. 10 stand posts would be constructed for the distribution of the water. The capacity building would be done by the implementing agency (SURABHI) and WOTR. 2. The provision of reserved fund is made in order to ensure the replacement of pump set and minor repairs in valve, pipe etc after 5- 7 years so as to make the operation more effective and efficient.